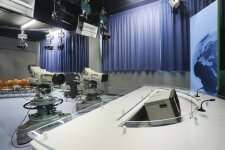 The Television studio is placed on the 3rd floor of the National Technical Museum. The exhibition is produced in cooperation with the Czech Television. Thanks to the co-operation with the Czech Television, the NTM acquired operating TV equipment, technology holders, and furniture, which were all used between 1997 and 2011 in the SK8 studio complex in the news building in Kavčí hory for everyday broadcasting. Most recently, the room has been used for sports programmes, e.g. studio commentaries to live football or hockey games. Because of its character, the exhibition is viewed with a guide, who explains and shows the visitors how a studio works. 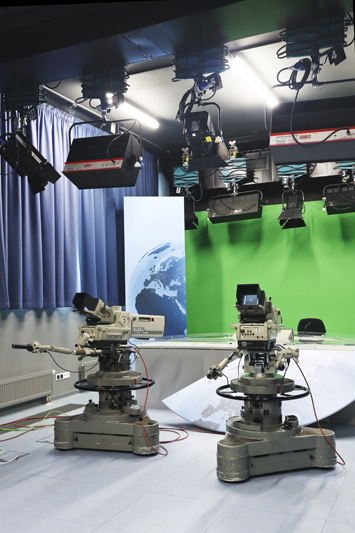 The visitors can try out the roles of the newsreader, meteorologist, cameraman, or director, while the others watch their more or less successful attempts from the audience space of the kind that we see in some talk shows. Other visitors look into the studio through a glass wall from the adjacent corridor, where text panels and interactive kiosk provide interesting info. So what equipment is there, The visitors can try their hand at filming with Sony BVP 500P cameras, placed on bulky studio tripods, sit behnind a Sony DME 7000 image processor or Sony MXP 29 audio mixer and watch the images in the studio and the production control room on several types of professional Sony monitors. 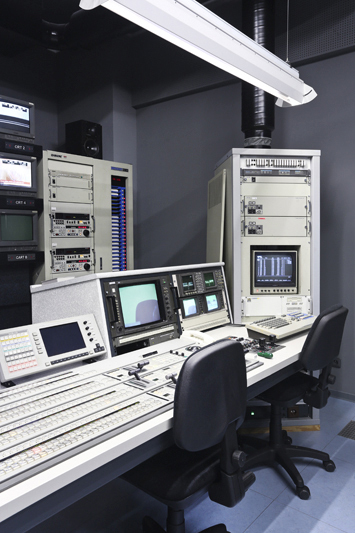 The equipment of a TV editing room, where footage shot on location was edited, is represented by a Sony BVE 600 editing unit, a Sony PVW-2800P Betacam SP editing recorders/players, or an ASTON MOTIF XP character generator. A real treat is a Sony BVC-10P Betacart, a recording tiwer weighing a few hundred kilograms and used from 19990 to 2009 in newsrooms for managing visual contributions to news reports. Before the broadcast, dozens of Betacam SP video cassettes, marked with barcodes, were put into the machine, which then automatically changed and played the cassettes according to a list.